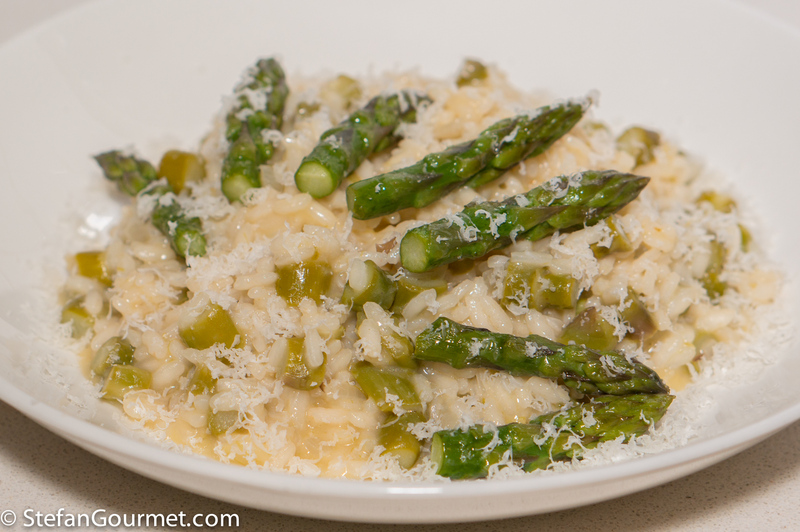 The season for asparagus has started, and so it is time for a nice risotto. The delicate taste of asparagus calls for a recipe with few ingredients, which does not even include pepper. Parmigiano reggiano should be used with restraint. 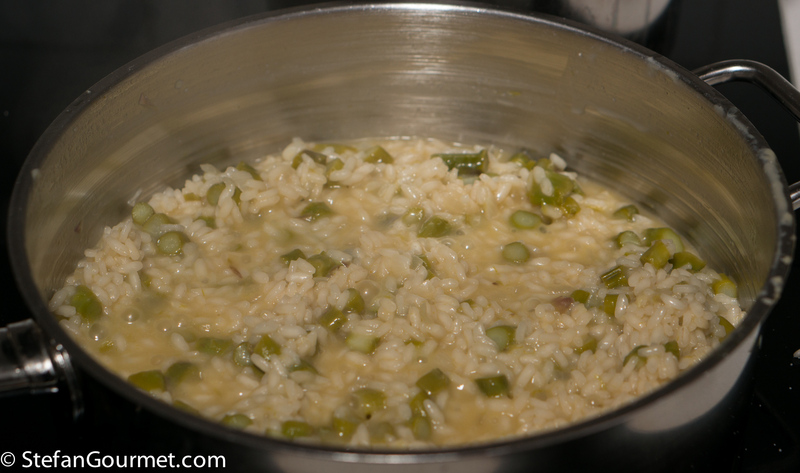 Some Italians even leave out the white wine in this risotto to make sure it doesn’t overpower the asparagus. Here is my version. 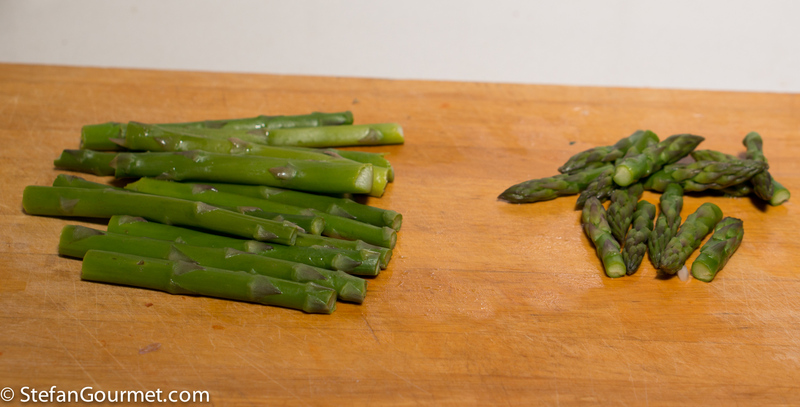 Snap the tough ends off the asparagus, and reserve. Separate into tips and stalks. Bring the vegetable stock to a boil. 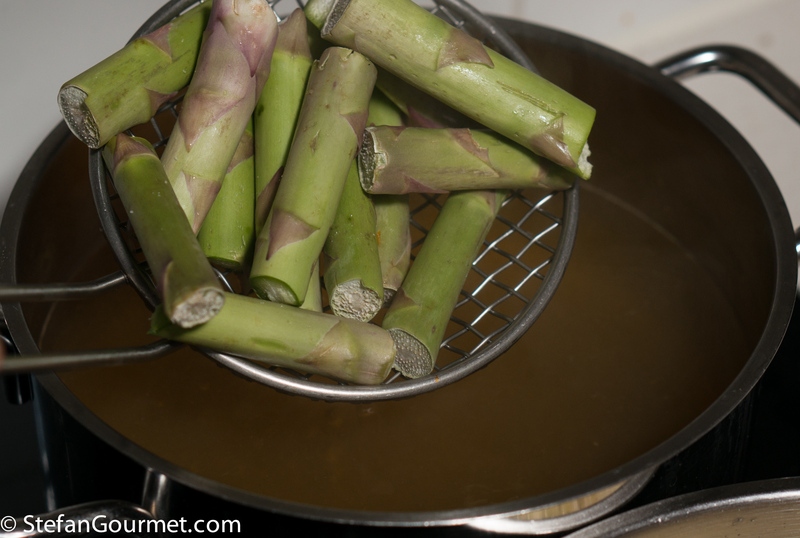 Add the asparagus tips and stalks, and boil for 5 minutes. 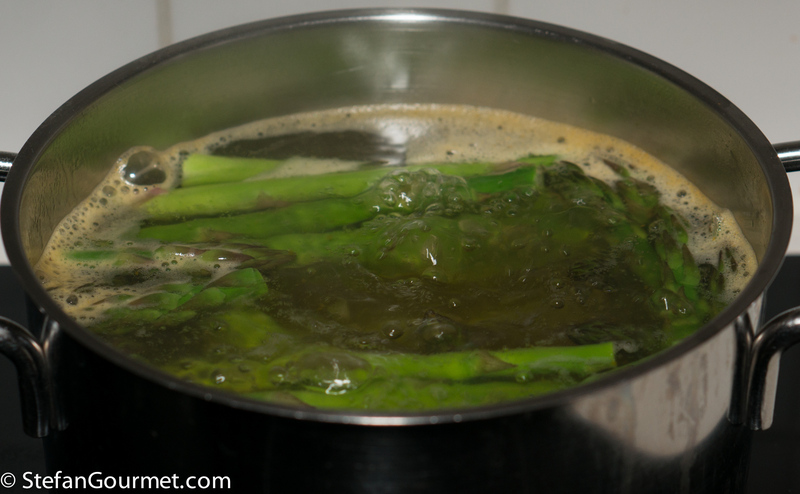 Boiling the asparagus in the stock will flavor the stock, so none of the flavor will be lost. 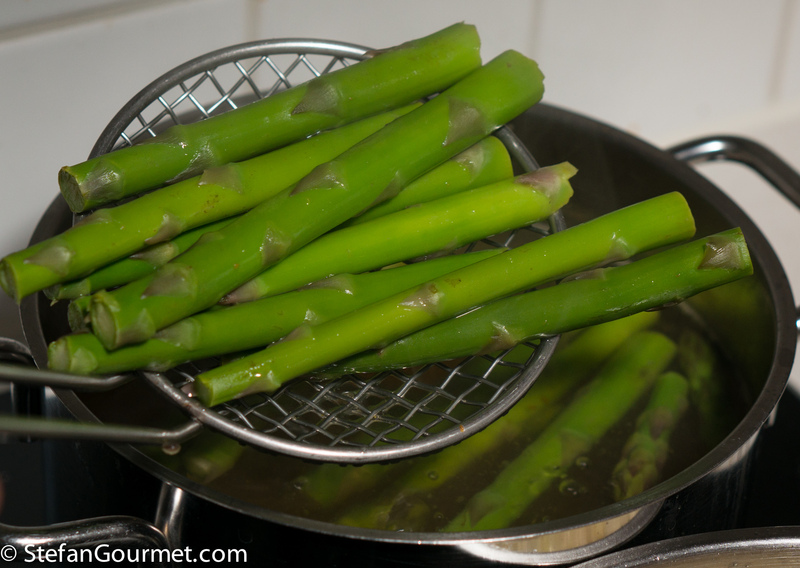 Lift the asparagus tips and stalks out of the stock using a strainer. 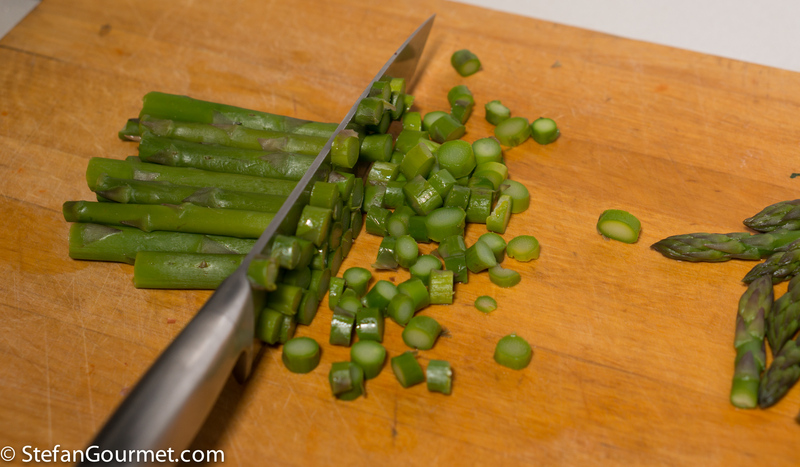 …but slice the stalks into rounds. Add the reserved tough ends to the stock, and keep the stock simmering. This will add additional asparagus flavor to the stock. 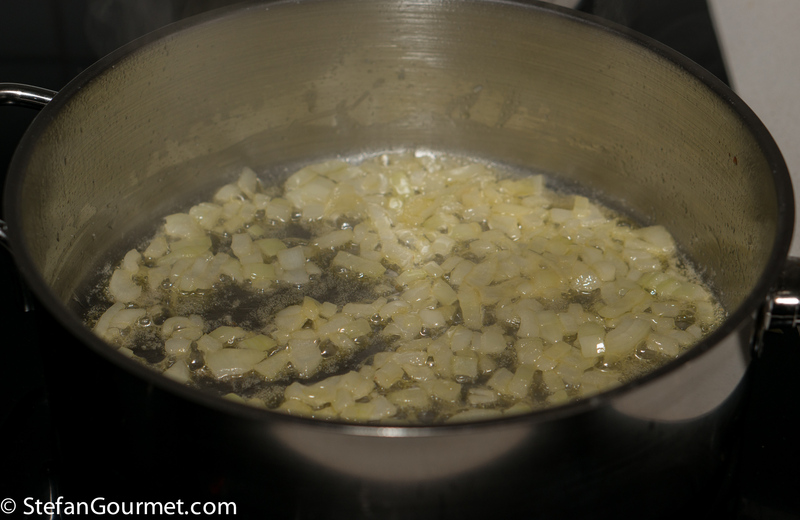 Sauté the minced onion in a wide shallow thick-bottomed frying pan in 2 tablespoons of butter. 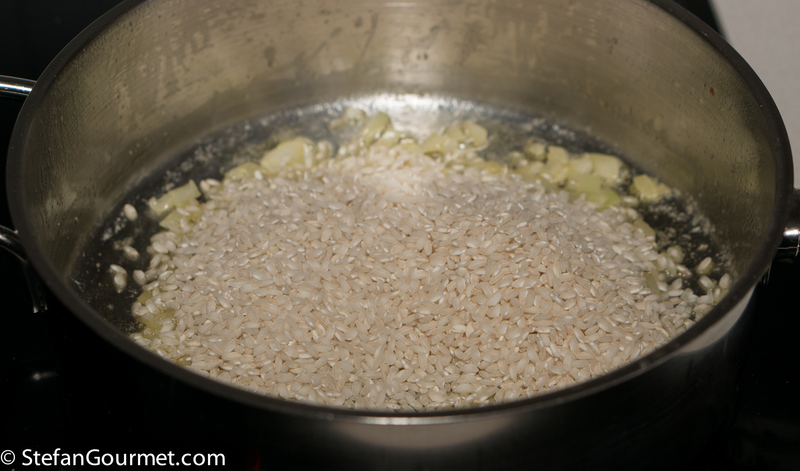 …and toast the rice over medium heat, stirring, for a couple of minutes. 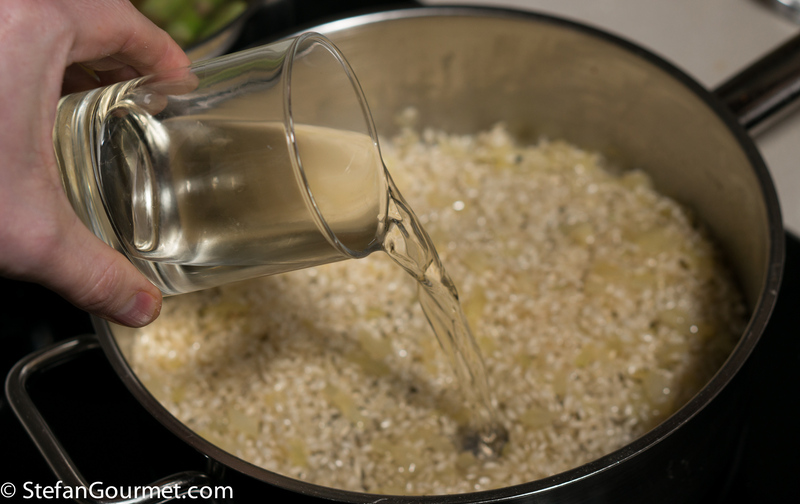 Add the wine, and stir until it has evaporated. Season with salt. 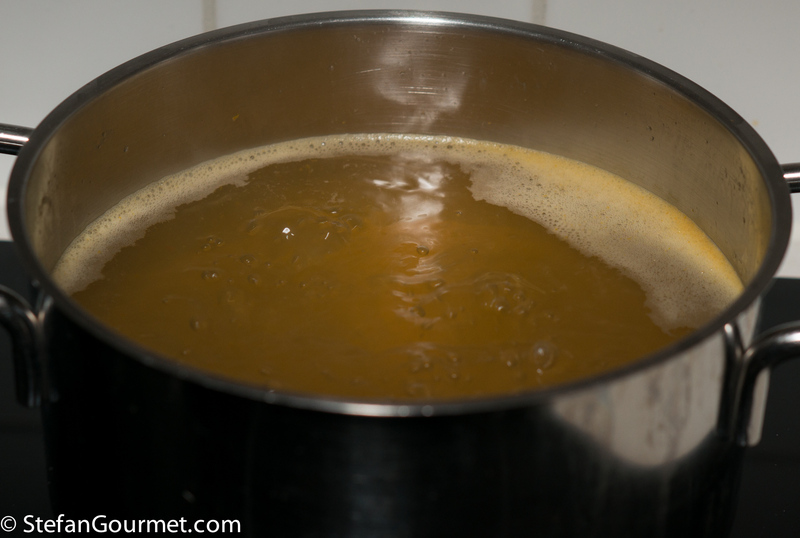 Add a ladle of hot stock, and stir until it has been absorbed. Keep stirring and adding more stock. 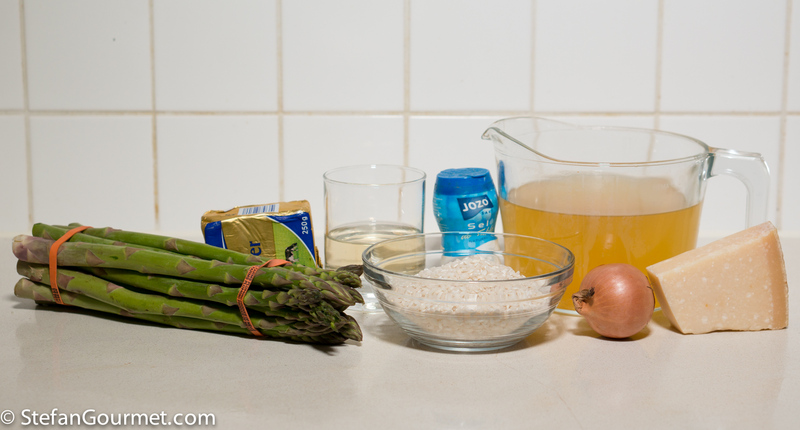 After 10 minutes or so, add the asparagus rounds. 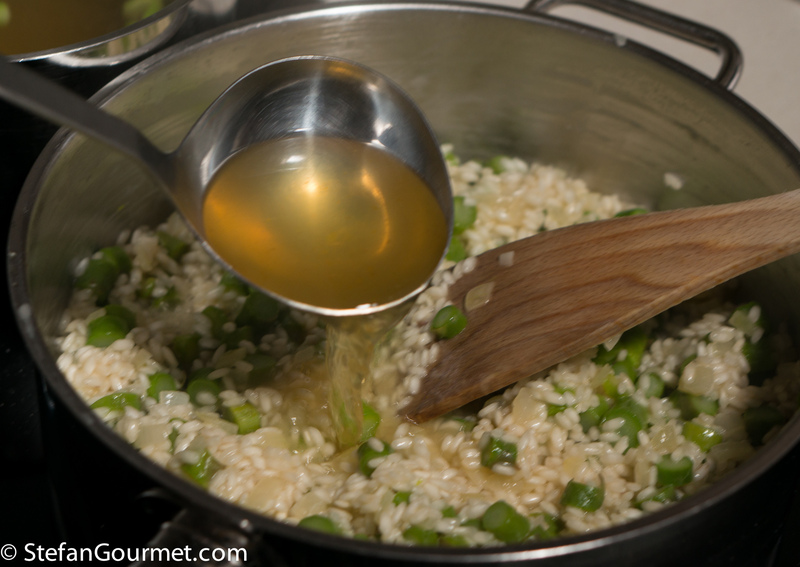 Keep stirring and adding stock until the rice is tender but firm to the bite, about 18 minutes from the time when you added the wine. 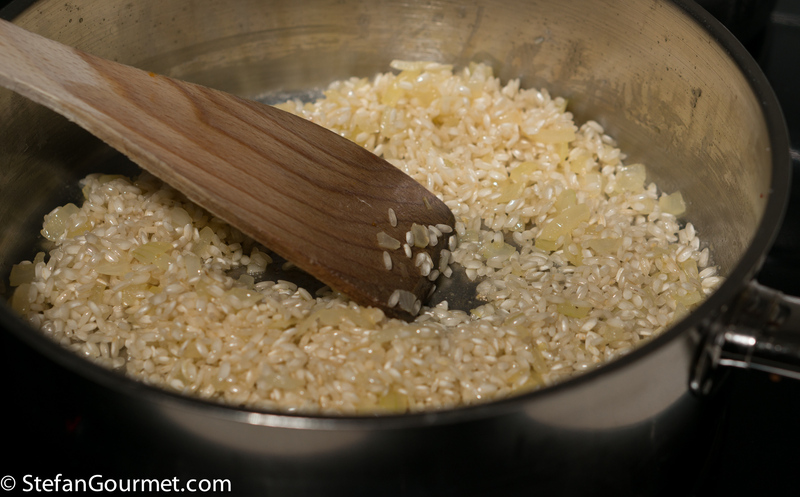 When the rice is cooked to your liking, add a final ladle of stock, and turn off the heat. 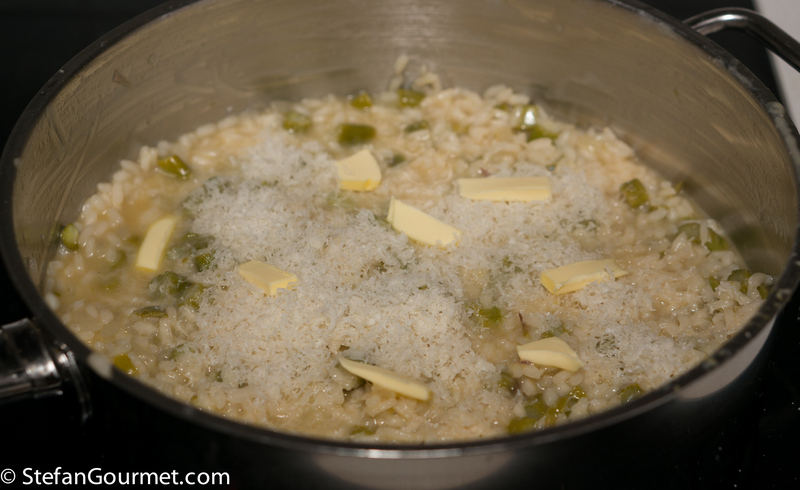 Add a tablespoon of butter, cut into small pieces, and a handful of freshly grated parmigiano. Stir until the butter and cheese have been incorporated. This is called mantecare. Taste and adjust the seasoning with salt. 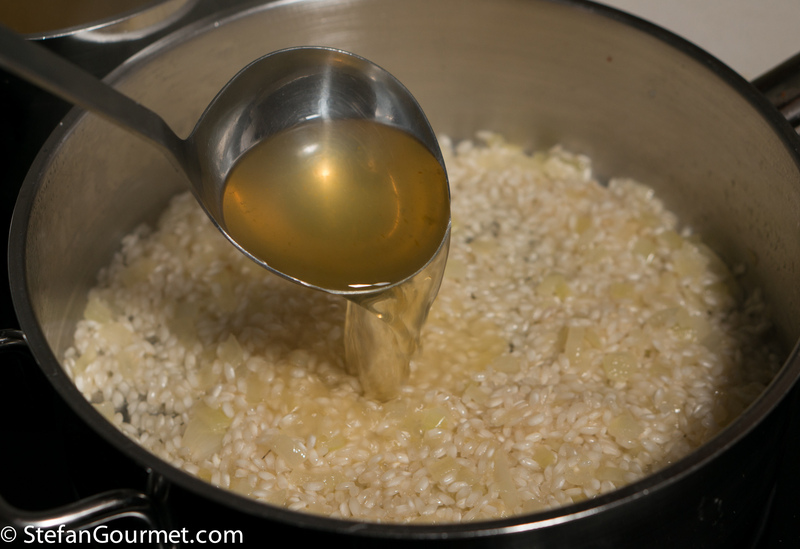 Allow the risotto to rest for a couple of minutes. 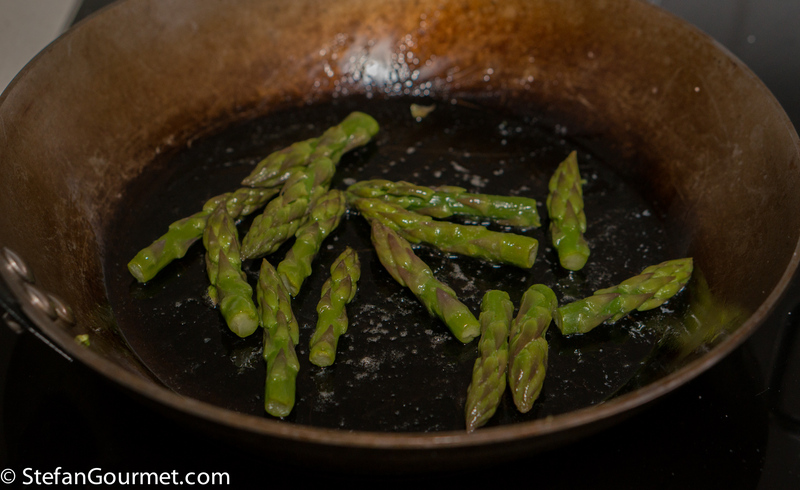 Briefly sauté the reserved asparagus tips in half a tablespoon of butter, and season them with salt. 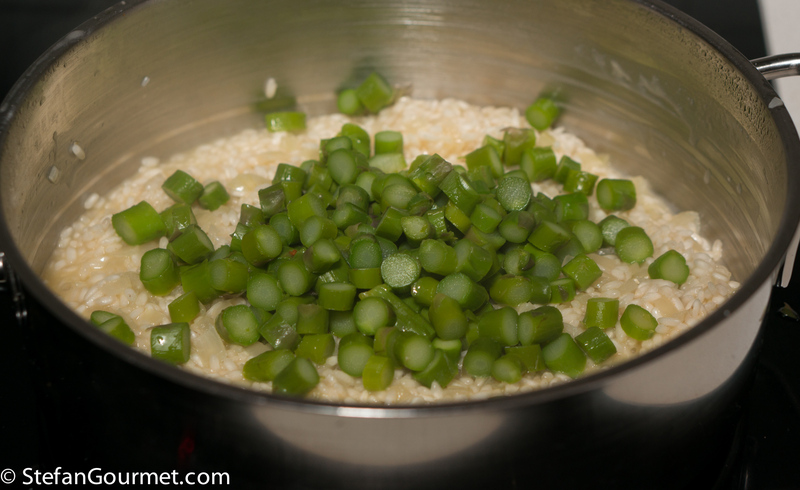 Serve the risotto on preheated plates, garnished with the asparagus tips. This is wonderful with a mild Sauvignon Blanc. Some Sauvignon Blanc from Chile has a similar fragrance as asparagus and will work very well with this. Most Sauvignon Blanc from New Zealand will be too aromatic and powerful for this dish. 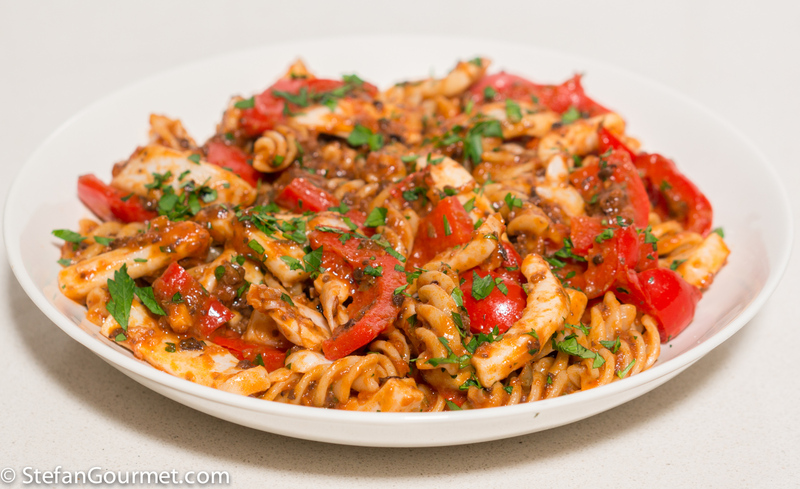 Pasta with squid and bell peppers is a summery dish that can be prepared all year round. This looks fantastic! Gonna try this one out. 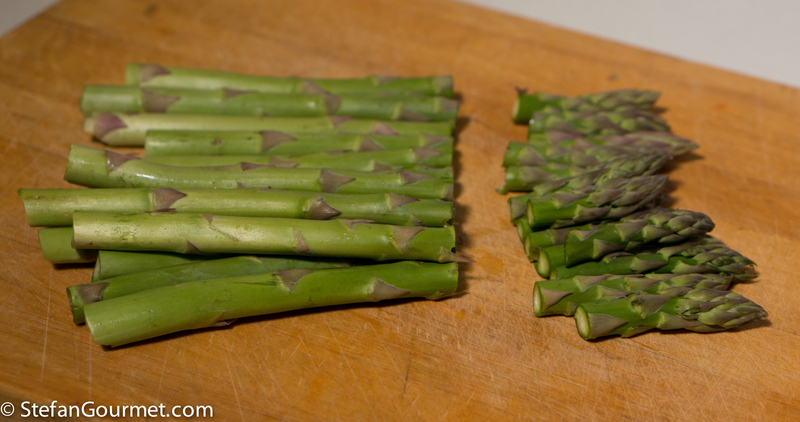 Lordie = spring and asparagus and artichokes are four to five coolish months away ! 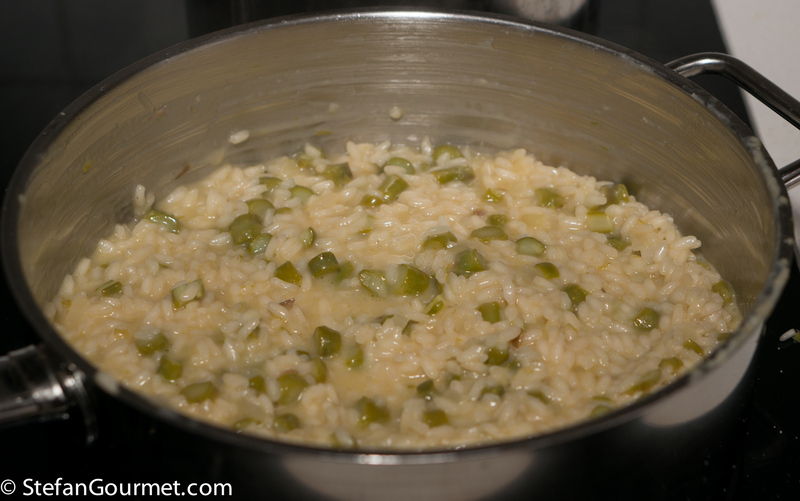 We share the love of risotto and asparagus, so – I am trying to find the reason of omission of some pepper . . . use parmesan judiciously anyways and cannot imagine the dish sans white wine. Shall try your way when the first green stalks appear , , , Sauvignon Blanc is one of my favourite go-to libations . . . Chile and NZ: matters have changed since ‘my time’ . . . 🙂 ! 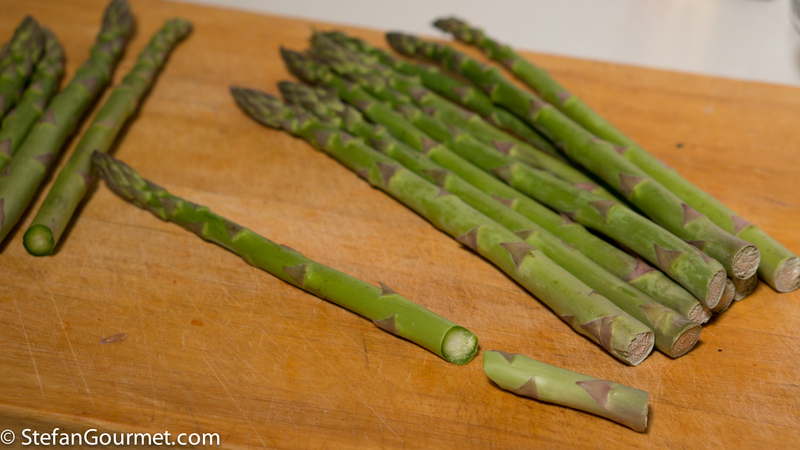 I am just harvesting my first garden asparagus, so this will be a perfect recipe to try this week, thank you!